This apartment building by Austrian architects LOVE architecture is part of the ongoing redevelopment of the port of Hamburg, Germany. The development is part of the HafenCity project, which is turning 157 hectares of once derelict waterfront into an extension of the city centre. Baufeld 10 was completed in 2008 and is next to Herzog & de Meuron's nearly complete Elbphilharmonie concert hall. Photos are by Anke Muellerklein. LOVE architecture and urbanism from Graz won the competition for “Baufeld 10.” The site is situated in an area within the Dallmannkai, directly on the water and in direct proximity to the “Elbphilharmonie” – a concert hall currently being developed by the Swiss Office of Herzog & de Meuron. In total, 26 architectural offices were awarded projects at the Kaiserkai. LOVE’s special challenge: The Baufeld 10 project was developed in a joint building venture. This means that the various future residents worked together to create a real community for the new building. Within this model, individualists connected with each other with the goal of building THEIR communal house. The building typology had to meet this expectation. This is why the building houses many different building typologies with all kinds of furnishing standards: from very large apartments (up to approx. 225m2) to smaller units (approx. 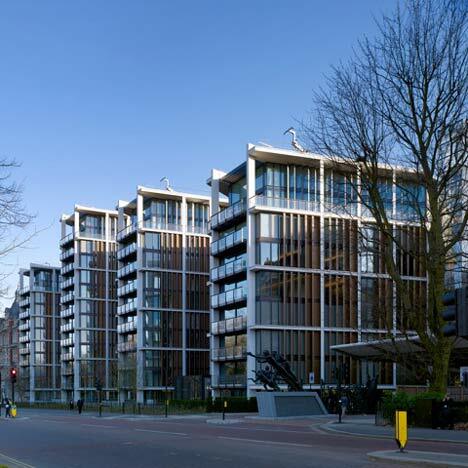 50m2), which feature entirely different designs – from one-storey apartments to maisonettes that stretch across four storeys. For Baufeld 10, individualisation was the top priority. Each of the 28 new residents can now enjoy his or her unique lifestyle within his or her apartment – whether horizontal or vertical – whether in a small or a big apartment. These different visions were blended into one building – to everyone’s satisfaction. 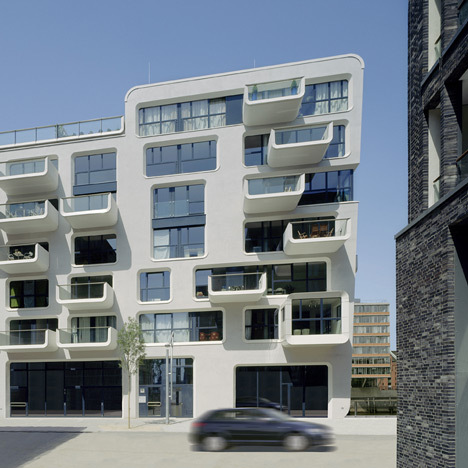 Viewed from the outside, the residential building presents a gleaming white structure formed of slightly bevelled cubes and with generously proportioned, slightly bevelled window openings. The configuration of these window openings matches the layout of the apartments behind them. Each apartment has a balcony and/or bay which protrude from the building. Within the rigid row of buildings, this configuration provides maximum views in an “exciting direction” – namely, the harbour. The support system consists of a supporting building envelope with stiffening apartment partitions and storey ceilings and was calculated as a spacial static system. This made it possible to place the quite large window openings freely in the exterior walls of the building and to minimize the concrete and steel volume used, which also reduced the construction costs. More structurally demanding parts of the building, such as the roundings of the facade, the balconies and the bays, were executed as prefabricated elements. The facade, which serves as an outside composite thermal insulation system, was provided with a “natural stone plaster” surface. This is composed of natural stone grains with an admixture of mica, which causes the facade to sparkle slightly in the sun, a valuable visual effect. The window roundings and the bevelled window reveals were modelled into the composite thermal insulation system with thermal insulation moulding. Regarding the building’s technical characteristics, the apartment building was planned and built according to the latest Energy Conservation Regulations (EnEV). The building features a very light construction mass and a building shell that provides excellent air sealing. One definite cornerstone of the building’s energy concept is its connection to the local heat and power plant, which combines the production of heat and power. Outfitting the apartment building with a solar thermal system of ten vacuum-tube collectors for the central domestic water supply is an additional energy efficiency measure. The solar thermal energy system and the heating connection to the local energy provider combine to cover the heating requirement of about 30 kwh/(m2a).